Sir Dr.M.S.Gosavi College of Pharmaceutical Education and Research, Nashik has advertised in LOKMAT Newspaper for the recruitment of Professor/Associate Professor/Assistant Professor job vacancies. 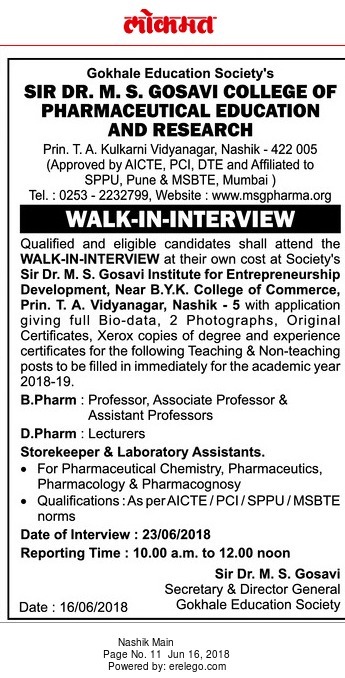 Interested and eligible job aspirants are requested to appear walk in on 23rd June 2018. Check out further more details below. About College: Gargi Agriculture Research And Training Institute(GARTI) is very young. The opening ceremony has been organized in 2006. But our Chairman, Mr. Rajan Bachhao is working for this project since 2000. He has travelled around the world to get advise from specialists and to build the Gargi Agriculture Research And Training Institute (GARTI) Syllabus.